Your view on antinomianism is interesting, but I have to admit, it is a bit hard to follow. I can't quite see how people who accuse others of being antinomians are the real antinomians, and how Evangelical Christians would be the real legalists, and I read through your essay several times. You are also quite hard on your brethren in the Bible belt, who give presentations that are "weak, adulterated, twisted, shallow, amoral, etc." Are you sure you are being fair to them? Do you think there might be a bit of dissonance here? Does the gospel really have to be this complicated? What's wrong with preaching the simple things Jesus said, and trying to do it? The thing I most agree with what you say is: "The purpose of the law is to show us the unattainable standard of righteousness that is required...and look outside ourselves to Christ." This is how I live the law. First I try, and I fail, and I turn to Christ for forgiveness, and ask for his help to be a better person. Then I feel his forgiving power flow into me, and divine spirit strengthen me in my resolve to overcome my weaknesses and addictions. Then I keep trying to keep the law. Why? Because Jesus asked me to keep it, and I want to be close to Him. What do I care about salvation in the next life? I want Jesus NOW. I want salvation NOW. I fall from it daily, and daily I pick up my cross and beg for it again. The Evangelical grace paradigm seems confusing to me, because it seems to be about some vague notion of one-time salvation in the afterlife: some really nice place in the next world, which you can get just by confessing Jesus Christ crucified. And if somehow you missed your chance or rejected Christ, you burn for eternity, even if you were a good person. That sounds fishy to me. But what about those, like Mormons, Catholics, or Jews, who try to keep God's commandments, who cry unto God, their support, their arm, their salvation as part of their daily walk? What of their testimonies, the forgiveness granted them, the divine strength bestowed upon them as they strive to work righteousness? The ravings of Evangelicals seem confusing to them. Grace and works are constantly intertwined. Every good work is given of grace, and every grace inspires good works. Trying to separate them seems non-sensible and counter-productive. I can see how Paul's grace paradigm makes perfect sense when trying to get a group of converts to abandon the law of Moses, but I just don't see the point in the modern world. To me, it seems like you are straining at a gnat and swallowing a camel trying to twist Paul's scriptures into some kind of universal interpretation that everyone seems to be misunderstanding. Sure, it's a true principle that salvation is free and we won't be saved by works. But so what? What about after that? We go and get saved, and then get back to work. It doesn't seem that complicated, yet Evangelicals make a big deal about the fact that you don't have to work. This is confusing because the Bible is full of admonitions to work. The Evangelical church if full of "saved" people. Why do they need to hear more that they don't need to work for salvation? They are already saved. So they need to get to work! As Jerry Falwell said, he doesn't want bare bones salvation, with all the slacker Christians. He wants to get the best salvation, the best mansion in heaven, and to get that, you have to work for it. 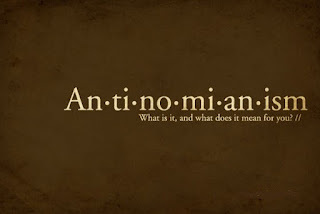 The issue of antinomianism can seem confusing, but it really isn't. It's just a matter of asking who is honoring the law for what it is. What exactly does a person need to do in order to receive the forgiveness of sins? I believe that to receive forgiveness of sins, one must repent. What does repentance mean? For me, it means two things: the acceptance of Christ's grace, as well as a commitment to change our behavior so that we don't commit the sin again. Without that commitment, and our imperfect efforts to follow up on that commitment (works), I don't think you can call the repentance sincere. The forgiveness comes first, and we follow up with works to honor our commitment. Of course Christ will forgive us again if we repeat the sin, (seventy times seven, even infinitely). But we must continually repent in order to keep our justification before God current. I would be interested to hear how your belief differs. I appreciate your insights. They are very clear. You first said that in order "to receive forgiveness, one must repent." You defined repentance as 1) accepting the grace of Christ (I'm not sure what you mean by that) and 2) committing to change your behavior so as not sin again. You said that the committment must be followed up by works, which you insinuated would be imperfect. 1) What do you mean by accepting the grace of Christ? 2) Have you repented according to your definition? 3) Why must our repentance be imperfect? Do you believe we cannot obey? Do you believe we have to sin? Do you believe God gives commands we can't keep? What is the ultimate reason why we sin? But then you said, "forgiveness comes first, and we follow up with works to honor our commitment." I'm a bit confused by this, because before you said that we needed to repent (which included following up on our commitment) in order to receive forgiveness. Can you clarify? Ok, I'll do my best to clarify. 1. Accepting the grace of Christ would mean accepting Christ's forgiveness of our sins and thereby becoming clean before God in that moment. We don't have to "prove" anything to him in order to accept this grace. We just need to commit our life to Him. We accept forgiveness in that moment. But that cleanliness only lasts as long as we don't sin again. 2. Have I repented? Yes, many times, and been forgiven many times. Forgiveness is freely given when we repent, but because we sin over and over, we have to repent continually. Inherent in each repentance is a sincere desire to change our behavior. The "works" happen as we try to keep the commitment we made during repentance. If we sin after our repentance, we again become unclean before God, and must repent again because we have fallen again into error. 3. Why must our repentance be imperfect? I believe our repentance is perfect if we do it sincerely. Repentance only includes commitment. Not follow up "works." We can be perfect in our commitment. We will again make mistakes, but that is the future, and those mistakes will drive us to repent in the future. Do you believe we cannot obey? I believe that technically we can, but because of the weaknesses of our flesh, we don't. But I also believe that God gave us our weaknesses that we would be humble, and turn to Him for help in overcoming these weaknesses, "thorns in the flesh" if you will. "Forgiveness comes first." You said you were confused because I said "repentance includes following up on our commitment." Actually, I shouldn't have said this. Forgiveness and repentance are separate from the "follow up." If we don't "follow up" then we have sinned again, so we start a new repentance process. It doesn't really effect the last repentance process. Our sins are not retroactive. They only affect our future. Hi Nate, thanks for replying. Actually, this seems more confusing and less clear. In such a view, I do not know how anyone can ever know they have been cleansed, since cleansing depends upon repentance, but repentance is so undefinable. How can a person know they are sincere and have comitted? You seem to separated a person's work from the person himself, as if one's work is no reflection upon one's motives and desires. However, it is just the opposite. Our actions reveal the intentions, motives and desires of our hearts, and therefore if a person is sinning, that reveals their desire is for themselves and not for God, which calls their commitment and sincerity into question. In Deuteronomy 5:27, the people of Israel tell Moses to go to God and find out everything He wants them to do, to come back and tell them, and then they promised they would do it. God replies by saying: "You don't have a heart in you that is for Me, because if you did, you would keep all of My commandments all the time." (v.29) If we are morally honest, we know that the only reason why we sin is because we don't want to obey (since we are able to obey if we wanted to). If we had the heart to obey, we would do so, since God doesn't give us commands we can't keep. If we don't obey the commands, it shows that we don't actually have a heart for God. One cannot escape this. If you are sinning, then you aren't repentant, and you haven't followed through on your commitment to obey. If you haven't repented, then you aren't cleansed. In your own view, Nate, you said that if you sin then you are unclean. In that case, we are all unclean, myself and yourself included, and are all in serious trouble. Essentially, you are saying that cleansing depends upon our not sinning (our works), and that is just not what the Bible teaches. One ought to be extremely uncomfortable with such a view, not only because it disagrees with the Bible, but because if it is true, then we are all condemned. So in your view, does repentance have any place in the gospel? Or is it merely a one-time acceptance of Christ? Does one ever need to repent more than once? When Jimmy Swaggart had an affair, did he need to repent because of his lack of obedience to the works of God, or had he already been saved, so no need? Does the disagreement lie with the purpose of repentance? In my view, the purpose for repentance is not to collect a one way non-refundable ticket to heaven, just to "get saved." And I am not equating "cleansing" with "salvation." There is a difference between being clean and free from sin, and being "perfect" as Christ commanded us. Over time, as we repent again and again, and try to keep our commitments to him, we are able to become more like like Jesus. "Be ye therefore perfect" Jesus commanded. It has nothing to do with "where" we are going (heaven or hell), and everything to do with "who" we are becoming. Heaven would be hell for us, if we were filled with sinful and selfish desires. And hell would be heaven for us, if we were filled with the love of God and a heart for Him. Repeated acceptance of God's grace into our hearts can soften it, warm it, mold over time, so that our heart of stone can be replaced with a heart of flesh. But this doesn't happen at once. I'm not sure how this contradicts the Bible. It's not about "saving ourselves" through works. It's about accepting Christ's grace daily to perfect our imperfect walk. If we do works without repentance, without accepting Christ's grace, we won't get anywhere, not because it is theologically impossible or forbidden, but because it is universally impossible. We will fail over and over. No one can do it. But if we do our works while relying upon the grace of Christ continually, then we will find ourselves succeeding, and gradually overcoming our errors and having a new heart and a new spirit. The trouble is with your definition of repentance and your view of obedience and disobedience. In the first place, you are using the word repentance in a very narrow and erroneous way, as the LDS church has taught their members to use it. In Mormon theology, repentance is a five step process of dealing with your sin: recognize, sorrow, confess, make restitution, forsake. When those steps are followed then repentance has occured. In this view, repentance has to do with dealing with your sin. But this is not a warranted definition of repentance at all; it comes neither from the Bible nor from extra Biblical usage, and has more to do with the tradition of Roman Catholic penance, an idea foreign to the Bible. The English word "repentance" (an unfortunate translation due to its roots in penance) is the translation of the Greek word "metanoia". Metanoia simply means to "change the mind", and both in the Bible and in extra Biblical usage it has the widest possible range of application and is in no way limited to having to be about sin. In fact, there are common examples of the word being used in extra Biblical Greek writings to show a change of mind from doing right to doing wrong! That is, they repent and do evil! In the Bible, God "repents" many times. This doesn't mean that He recognized and deal with His sin! It just means that He changed His mind. Thus, when we read and talk about repentance in the Bible, we cannot just assume it means dealing with your sin. If someone is commanded to change their mind, the natural question is, "About what?" Jesus gives us the answer: "Repent(change your mind) and believe the gospel." (Mark 1:15) Not stop your sin, but change your mind and believe the gospel. Or Paul in 2 Timothy 2:24-25: "And the servant of the Lord must not strive; but be gentle unto all men, apt to teach, patient, in meekness instructing those that oppose themselves; if God peradventure will give them repentance to the acknowledging of the truth." Here repentance is a change of mind from believing a lie to acknowleding the truth. And what is the truth? What is the gospel? It is the news that God justifies the ungodly through faith in Jesus Christ without any works whatsoever, because of what Jesus did on the cross for sin. HE dealt with sin, not we, and we simply trust in Him. Unless a person has believed this gospel, they have not repented; no matter how much they try and deal with their sin, they are ignoring the truth. So must a person repent in order to be forgiven? Yes, of course, the Bible makes that abundantly clear. But repentance unto salvation doesn't have to do with dealing with your sin but believing the gospel. This is why it is a one time thing. The second problem with what you are saying, Nathan, is that you seem to not be making sin an issue of justice. It sounds like for you sin is merely an issue of becoming a better person, being comfortable in heaven, improving yourself and being happy. While I will not argue that sinning has disruptive consequences, obedience and disobedience is about so much more than these things. They're about justice. Granted, if you kill someone you will feel horrible and so will the victims family, but beyond this plain fact, you have committed an evil that God, who is the just judge, must punish. You yourself are condemned before a just God. Justice is really the main issue of the atonement and we dare not ignore or lessen it. When we sin, besides all the obvious consequences, we must face the realities of justice. Sin must be dealt with, and we sin every day. If dealing with sin to escape the demands of justice depends upon us (as the Book of Mormon teaches, 1 Nephi 15, Alma 42, etc. ), then we are truly damned. If God's wrath is only turned away from us if we meet the conditions of obedience, then we are all doomed. If, on the other hand, God's wrath is turned away from us by grace through the blood of Christ, as the Book of Romans teaches, then we have great hope. So the ultimate issue is the issue of justice, and everything else is penultimate. When you sin tomorrow, what must be done in order for God's just wrath to not fall on you? That's the issue. That's the issue the Bible focuses on from Genesis to Revelation. Your definition of repentance have helped clarify the problem for me. Yes, we do see repentance in a very different way. It is true that in Mormon culture, the rhetoric about the repentance "process" sometimes overshadows the role of grace within the process. But the Book of Mormon is very clear about the role of grace, and that it is only through Christ that these sins can be forgiven, and not our works. If I'm not mistaken, in the Evangelical view, repentance and acceptance of Christ's grace is primarily a question of justification. That is, having sinned, the price must be paid, and we cannot pay it ourselves, and must therefore be damned. Acceptance of Christ's grace, (repentance as belief only), justifies us. Once that justification is complete, there is really no need to perfect ourselves through works, because in the Evangelical view, justification through grace is a one-time occurrence, and Christ carries the full weight of the justification for us. Am I correct in stating your view on this? Mormons actually believe similarly in the concept of justification: that is, that the blood of Christ pays the price for our sins when we repent. (Although there are "steps" to repentance, we still believe this doesn't pay for the sins, but merely proves the sincerity of our belief and desire to change.) But we do not believe that justification alone is sufficient. It only cleanses us of sin. But Christ commanded us to "be perfect." We can be "clean," but still be weak, and prone to sin again. There is an additional concept that is equally important, which we call "sanctification." Sanctification is the process of becoming "perfect" as Christ commanded us, which happens through continual effort (works) in concert with continual repentance and acceptance of Christ's cleansing of our sins. So grace and Christ's blood cleanse the believer continually, day after day, every time he repents. Far from being "salvation through works," it is a life full of grace and works, with the humble acceptance that we are always inadequate without Christ's grace to help us in everything we do. The root of this doctrine lies in our views on the afterlife, which includes varying degrees of glory, the concept of eternal progression, and becoming "a god." But even though we progress, step by step through our efforts, it is always "through the atonement of Christ," and would never claim that we can progress through our works alone, but through grace in constant concert with our works. However, Mormons are not alone in speaking of progression, and varying degrees in heaven. Even Jerry Falwell has spoken about different levels in heaven, and that he doesn't want to be in the lowest level with all the lazy Christians, but in the highest, with the real Christians who make genuine sacrifices for the gospel. This sermon was recounted in the book "In The Land of the Believers." And C. S. Lewis also talks a lot about perfectionism, even going so far as to use the Biblical language "becoming gods," which Mormons take literally. So to sum up, we believe in justification and sanctification: Justification: limited and temporary, but continually given to us each time we repent, with no works needed. Sanctification: ultimate perfection achieved through both works and the repeated process of regular justification through the atonement of Christ. Where we go from here, I don't know. At least we may both may have a better understanding of where our differences lie. But if you can admit that even among Evangelicals, there exists the concept of continuing progression, different levels in heaven, and eventual "perfection," after one has been "saved," then we may really not be as far apart as we think. I wouldn't go to either Falwell or Lewis for theology. Neither of them were theologians. I disagree with them both on the point you have shared. The issue for me hasn't changed since my last few comments. If repentance is required for forgiveness, then none of us are forgiven, since none of us have repented. Every time we sin we make a freewill choice. The very thing that makes sin sin is that that we choose to do what we know is wrong, and we don't have to do it. If we had to do it, it wouldn't be sin. If we didn't know better, it wouldn't be sin. But the reality is, we all sin everyday. We are without excuse everyday. Our sinning shows that we are not truly repentant. If someone actually wanted to obey, they could obey. Our actions reveal the intents of our hearts. Therefore, if the atonement of Christ and the forgiveness of our sins depends upon our repentance, desire, willingness, obedience, etc, then we are all unqualified because we all show that we are truly disobedient at heart. It must be by grace to undeserving sinners. It must be offered to unworthy sinners by faith alone. This is what the Bible is all about. As Eli mentioned, we are all unqualified because we all show that we are truly disobedient at heart. As Jesus clearly defined for us in Math 5:27-28, the true issue is the very heart of man. Sin is the very essence of our being. Even man in his very best estate is all together vanity(Psalm 39:5). We can't add anything to the salvation process. Even our repentance, desire, willingness and obedience are tainted by this sinful nature that is within us all. What about the thief on the cross that turned to Jesus in the last few moments of his life? Did he have a penitent heart? The scripture doesn't tell us that he repented, but he obviously saw his need and saw that Jesus was an innocent man and the he and the other thief were getting what they deserved. The thief through himself on the mercy of God and asked to be remembered when he entered his kingdom and Jesus' response was "today you will be in paradise with me." It's a conscious decision that we are to make based upon truth not feelings". Whosoever shall upon the name of the Lord shall be saved! Now allow us to peel off the theological bark and shine the spot light on this ancient dogma to learn the bare truth of what Antinomianism is in the Greek Epistles (Strong # 458, 459, 560, Antanomia.) Yet, what does this term in the Bible really signify to be Greek Strong # 458, 459, 560, Antanomia i.e. Anomia, meaning Antinomian i.e. Antinomianism. As Jesus and others who spoke concerning Antinomianism again in the Epistles all were in relation to a public rebuke of sinful wickedness. Just look at one verse (Matthew. 7: 21-23) Who are those that find themselves expelled by Jesus.? ? ? Who are these people? ? ? The Antinomians being talked about here that call Jesus “Lord” and even do good works in His name. They expect to inherit eternal salvation, nevertheless find themselves expelled by Jesus from salvation. The Greek term in (Strong # 458, 459, 560, Antanomia.) used a singular “A” prefix letter to abbreviate for “no,” “not,” “without” or “ANTI.” “A” prefix letter attached to a Greek word gives the word a negative meaning, same as “A” prefix letter attached to English words as Amoral, Atheist, etc. The disposition exhibit in the meaning of this word is that those who consider themselves as antinomian are against the Lawgiver IE they are the anarchists of God’s Law. The Scriptural Law is the (Greek Strong’s # 3551 NOMOS.) Antinomianism is antithetical to the Lawgiver’s scriptural sovereignty. (Lev. 4:2) express this reprimanded sin as “Against the Commandments of God.” or Anti-commandments. The Torah (Hebrew Strong’s # 8451) signify the scriptural Law, is interchangeable with the (Greek Strong’s # 3551 NOMOS) and the Greek term “Nomos” is the word used by the ancient translators of the Septuagint to translate the Biblical Torah (Hebrew Strong’s # 8451) to the Greek Bible. As used in (Hosea. 8: 1) “They transgressed My covenant and transgressed against My law [Torah. ]” As Hosea expression Against God’s “Torah,” is coined in the Greek by the word Antinomian.